It's a conclusion reached many times before: global warming is the new normal. But this time, Americans are beginning to hurt from its painful pinch. The "Third National Climate Assessment" compiled by more than 300 national experts over the last three years reported that temperatures at sea, on land and on ice all indicate a warming trend over the past century. The decade starting in 2000 is the hottest on record. The year 2012 is the hottest ever recorded in the US history, said the report. The temperature in the US is 1.3 degrees to 1.9 degrees Fahrenheit warmer now than it was in 1895. Most of that increase, or 80 percent, occurred over the last 44 years. A prolonged drought that parched southern California and record monster wildfires in several western states are among a plethora of climate change events that all took place in recent years and that are indicative of the warmer world Americans now live in. The report noted that "Americans are noticing changes all around them. Summers are longer and hotter, and extended periods of unusual heat last longer than any living American has ever experienced. Winters are generally shorter and warmer. Rain comes in heavier downpours." US scientists said the climate is changing in the United States almost without a doubt and that the warming of the past 50 years is primarily due to emissions of heat-trapping gases released by humans. Burning coal to produce electricity and using gasoline in motor vehicles and other factors contribute to the problem, the assessment said. By the end of the century, temperatures could be up to 5 degrees higher if US acts aggressively to cut greenhouse gas emissions from industry, or up to 10 degrees if emissions are high. The higher the temperature, the worst the impact. Extreme weather in the United States has "increased in recent decades," the report said. "The report affirms a number of things we have known," said Katharine Hayhoe, a professor at Texas Tech University in Lubbock and lead co-author of the changing-climate chapter of the assessment. "But there are new aspects," Hayhoe said. "For a long time we have perceived climate change as an issue that's distant, affecting just polar bears or something that matters to our kids. This shows it's not just in the future; it matters today. Many people are feeling the effects." 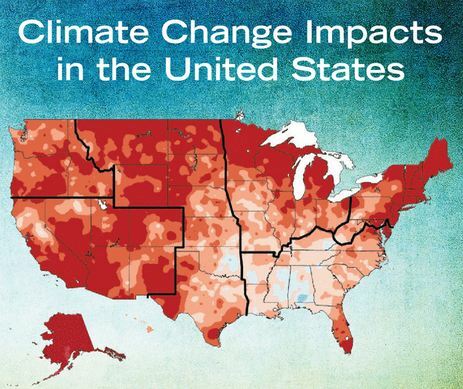 This third assessment has a website with interactive tools that shows Americans how they can help cut climate impacts. The assessment can be seen here. The federal climate assessment involved hundreds of climate experts from academia and government. These experts were brought together in an effort to guide US policy based on the best available climate science. The US Global Change Research Program described this group as "the largest and most diverse team to produce a US climate assessment." The group worked for several years and held 70 workshops nationwide and revised the final drafts to reflect thousands of public comments. They were guided by the National Climate Assessment and Development Advisory Committee consisting of 60 members. The report jibes with the findings of a global report by the International Panel on Climate Change. "This is not some distant problem of the future," President Barack Obama told NBC. John Holdren, who directs the White House Office of Science and Technology Policy, said climate change "already is affecting every region of the country and key sectors of the economy." The Obama administration wants the report to ignite awareness of the need for government and communities to respond now to climate change.